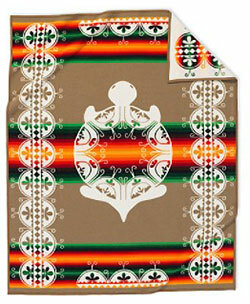 From 1991: The Turtle blanket is in recognition of the Iroquois Confederacy. 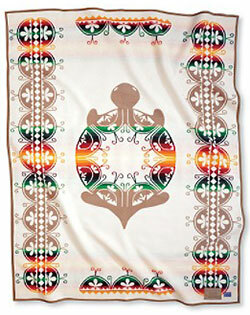 Inspired by the Oneida, Seneca, Mohawk, Cayuga, Onondaga and Tuscoarora Nations, the Turtle design represents the Iroquois legend that the world was created on the shell of the Great Turtle. The Turtle was the only one with enough strength who could support the earth on its back, says the legend. And the earth grew larger until it became the whole world. 82% pure virgin wool/18% cotton warp. Dry clean. Made in the USA. 64" x 80"